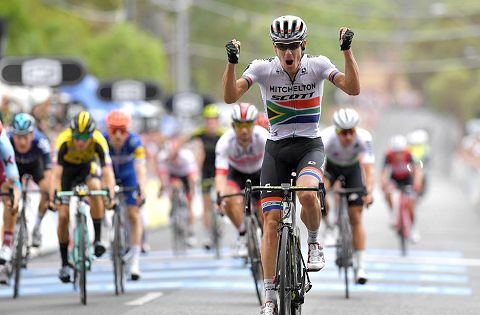 Defending champion Daryl Impey has taken an emotional victory on stage four of the Tour Down Under, recovering over the famous Corkscrew climb to sprint to victory ahead of race leader Patrick Bevin (CCC Team). Despite his overall victory last year, it’s the first stage win at the Tour Down Under for Impey, who has previously podiumed on six occasions. The South African, who dedicated his victory to a family friend who passed away just before his travel to Australia, now sits second overall, seven seconds behind Bevin. Six riders rode out to over five minute’s advantage during the stage, which caused a strong reaction from the bunch as five teams committed to the chase. Mitchelton-SCOTT put Luke Durbridge and Michael Hepburn to the front, and they were joined by Astana Pro Team, Trek-Segafredo, CCC Team and EF Education First. By the bottom of the final climb, the remnants of the break were in sight and no longer a threat for the stage. The first true sign of climbing form, the Corkscrew, didn’t disappoint. Michael Woods (EF Education First), Richie Porte (Trek-Segafredo), Wout Poels (Team Sky) and George Bennett (Jumbo-Visma) rode supreme and crested the top with a 15-second advantage over a reduced group of chasers. With a teammate for support, Impey settled into the chase group on the descent as Lucas Hamilton moved to the front in pursuit of the leaders. The effort was good enough to bring the leading quartet back with two kilometres to go, setting up a dramatic final corner and reduced bunch sprint to finish. Impey chose the wheel of stage two winner and current race leader Bevin, before jumping ahead to claim his first ever Tour Down Under stage victory. Daryl Impey – Stage 4 winner: “A good friend of mine passed away from a heart attack recently. I left (South Africa) in a bit of a sad mood and it was a pretty rough time for our whole family because he played a big part in my family. When I came here I wanted to do something special and to be able to deliver today was pretty emotional and definitely a confidence booster. “We are around the mark now. Seven seconds is still quite hard to get on Paddy (Bevin), he is riding really well and we are quite similar in characteristics. We’re going to have to go for it, tomorrow will be quite an interesting stage and definitely Willunga will still be the decider, although Paddy has got a really nice buffer to the other GC guys. “I think we have to be aggressive wherever we can. There’s no doubt that trying to win this race is based on seconds, we learnt that last year, so we’re going to have to try to take our opportunities and make things happen and hopefully it pays off. “Lucas (Hamilton), the win was actually due to him, he did a great job. He is still a young professional, but we had a plan in the beginning that he was going to ride his own climb and wait for me in the middle which he did, and then he did his work on the downhill and brought them back. He played a massive role so I could just sit back and think about the sprint. He had an amazing ride for such a young guy. “I rode my own race. I knew I had Lucas there, I could see Paddy just in front so I knew if I stayed around that range we had a good enough group, that we were going to cooperate on the downhill, to try to bring those four back. I just focused on my own climb and I was very happy to still be able to do what I did at the end.